Becoming a resident of Norrath has never been so sweet! Starting today, new, current and returning EverQuest II players will be able to jump into the action and create level 85 Heroic Characters. The new program enables everyone to leap into the heart of the unfolding EverQuest II main storyline and prepare for the November launch of the Tears of Veeshan expansion. Screenshots to support this story can be grabbed right here. To kick off the program, SOE and ProSiebenSat.1 Games are hosting a “Hero’s Call” promotion: for a limited time new, returning and current players can create one permanent Heroic Character for FREE. The “Hero’s Call” event will run October 1-15. Outside of the “Hero’s Call” promotion, the Heroic Characters Program has three options for players: Try Before You Buy, New Heroic Character, and Upgrade Existing Character. 1. Try Before You Buy: This option offers one full level of play from Level 85 to 86 – which takes a typical player several hours - with 100 Alternate Advancement (AA) points to test out a class of your choice at a high level. 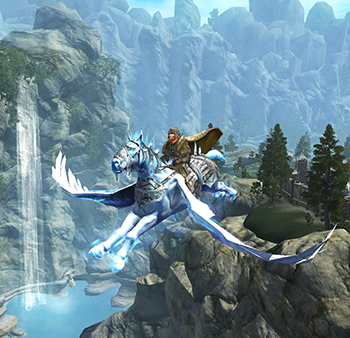 The Free Trial includes a flying mount, armor, consumables, and a few restrictions. 2. New Heroic Character: A full Heroic Character can be purchased at Character Select or while playing as a Free Trial character. It includes level 85, 280 AAs, all items included in the Free Trial, and is unrestricted. 3. Upgrade Existing Character: The Upgrade option allows you to select any existing character at any level and upgrade it to a Heroic Character. All upgraded characters receive level 85 and are increased to 280 AAs, but not beyond. If you are above level 85 and have more than 280 AAs, you won't receive additional levels or points, but will get a bundle of items that includes the flying mount, armor, and consumables. A Producer’s Letter by Senior Producer Holly Longdale regarding the Heroic Characters can be found here. For further inforomation, UK and Nordic media should please contact Tom, Lina or Tim at Renegade PR.